Hey all, hope your Christmas season has been joyful! Ours certainly has. Of course we've had to juggle extra activities like school performances and shopping. There has been extra traffic and longer lines. We continue wrestling with keeping the right balance between generosity and stinginess. We keep checking our motives - are we giving because we want to keep things even? Are we buying this present because we feel we have to? It's really easy to get sucked into the Christmas-shopping vortex and lose sight of the 'why'. This year our church has been doing a series of lessons on the Advent, the first for me, at least in a long time. It has been a really good reminder, not in some cheesy 'Jesus is the Reason for the Season'-way, but in a thoroughly deep way. We can argue about why we put up a tree, and whether putting up a nativity scene is a form of idolatry. We can study the history of why December 25th was chosen and argue about how much Christmas is appropriate to celebrate. What's important though, is to see the connection between the manger and the cross and how they both must be seen in light of the empty tomb and the purpose for which the Father send his Son. In the past, I've gauged my success in this in terms of simply remembering the nativity, of Jesus' birth and life. But this year it really served as a reminder to be grateful for the 'why' - for God's grace and forgiveness and to let that gratefulness then turn into letting that forgiveness flow unto those around me. December 24th - Our American friend Emily is spending the night with us and just being a member of our family. Our church is hosting a Midnight gathering where we will read the Nativity story, sing together and light the fifth advent candle. December 25th - Open presents and lunch at the Rotert home. Final packing and preparing for trip to Germany. December 26th - Leave at 7:00 am for Munich, and the next day on to Colditz. Check out www.midwinterrally07.com for a peek at what we will be doing there. From our family, have a very Merry Christmas! Go ahead. Let it sink in. Whew. Good stuff. Free-ing stuff, if we let it be. *From the article, "Religion-less Spirituality" by Timothy Keller. Thanks to Josh for sending it my way. Our annual Christmas-themed Coffee House is Monday night so we got together with the Roterts at La Via to set up the gi-normous fake tree, to listen to Christmas music and drink hot cocoa. As we were getting ready to head down, Heather noticed and then yelled at all of us that it was snowing! Those of you reading this from the snow & ice-pounded Midwest and Eastern U.S. probably think we're crazy, but in this mild Mediterranean port city, seeing snow is special. While we set up, the kids watched out the window as the flakes grew bigger and bigger. By the time we were done, it had stopped and nothing was left but wet pavement and a cold wind. It was fun while it lasted - hoping we run into more of the white stuff after Christmas when we head up to Germany...we'll see. To dispense justice and to free the oppressed. His seat wide, soft, ornate. Knowing the charges against him were impossible, ludicrous. Who was this flower anyway? How dare she make such a fuss? So she was stepped on? She was in the man’s way! Her golden middle was still gold. Murmurs of assent circle the room. As if to say, yes, who does care? “I DO!”, came a thundering voice from above. The man’s face was frozen ash. I care that her petal is not the white I made it! 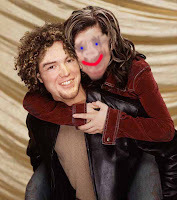 I care that she has been stepped on! Was instead taken and thrown away, misused and disrespected! I care that innocence has been stolen! I care for this flower and my decision will be known! Play your part, take your stand. Bang your gavel and read your verdict. Play at justice, with your man-made laws." But I am the Judge and from me there is no escape. Be sure and visit www.24-7prayer.com! They just put up our story which you have probably already read here - but you can check out all of their resources and encouraging stories of how prayer is changing lives and communities. Check out our first prayer room video created by our teammate Brian Rotert. You can also go to our church's site, www.laviaancona.it and click on 'Notizie' to get there. Well, we’ve had three days or more now to debrief and reflect on the prayer room experience. Thanks to everyone who wrote to ask for more details. I wanted to wait until now to spend some time processing, to see how people would respond, to see how God continued to work, to hear testimonies from those who participated, to speak to our Life Group and to get the pictures that were taken. I’m glad I waited. For those of you just catching up, we just hosted our first 24/7 prayer room. We are joining along with dozens of churches around the world involved with the 24/7 Prayer movement to host these times set apart for prayer. The general idea is to set aside a place (in a church, office, pub, van, tent, etc.) for a specified period of time to be dedicated to prayer. 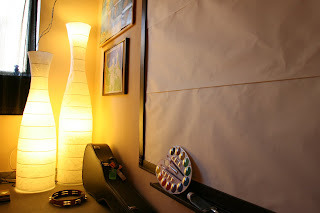 The location is set up creatively to encourage prayer in lots of different forms (painting, drawing, writing, meditating, kneeling, standing, sitting, pacing, dancing, singing, playing instruments, etc.). Heather took our team’s ideas and combined them with ideas we gathered at the Seville conference and mixed them with her own, God-given creative talents to create a beautiful prayer refuge. We took our little office space (about 15’x15’) and emptied it, storing everything in the backroom. Heidi helped her shop for supplies. She painted it a cream color. 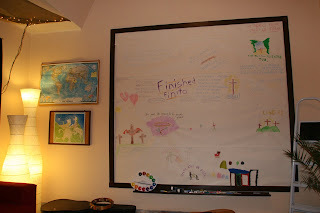 Brian and I mounted a large frame on the wall and Heather lined it with paper, creating a large, blank canvas. 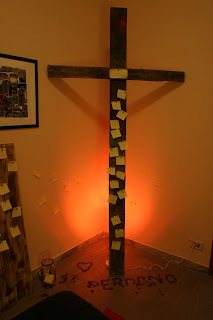 I built a rugged cross to place in one corner. Two maps were mounted in another. 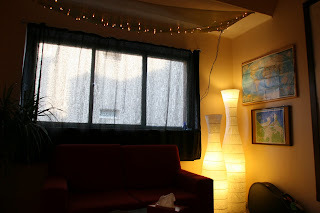 Heather created a veil of lights to hang over a couch. There was a small refreshment section as well as a musical station. 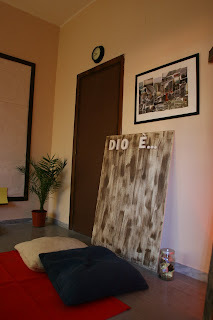 On a large wooden plank, she took Brian’s idea and placed the words, ‘Dio è…’ which means ‘God is…’. We divided up the 48 hours and recruited 26 of those slots to be filled assigning people to be on-call. In the end, a few people didn’t show up and several of us spent a few 2 and 3 hour turns in the prayer room. I counted 29 individuals who each spent at least an hour in the prayer room. Some of these were alone, others were in the room in pairs or small groups. There were 15 from our church, 5 from the Apostolic church, 5 Catholics and 4 who really don’t fit any of these categories. All of this to promote, foster and host 48 hours of continuous prayer in at least four different languages with people represented from the U.S., Italy, Romania, Holland, and Argentina. What was once a grey, dingy office space was transformed into a beautiful haven of prayer. Blank paper and canvas and walls were turned into praises, poems, drawings, paintings, songs, cries for mercy, thanksgiving and forgiveness. Our little community of believers rallied around the simple vision of spending time with Jesus. And that’s just what we did – we spent time with Jesus. 1. Time flies in there! 2. When is the next one? It was exciting, emotional, tiring, frustrating, refreshing and just, plain crazy. No one was healed, God didn’t speak audibly. There were no miracles except the miracle of prayer itself. -focus wasn’t ‘us and them’ but just ‘us’: so often I believe we err in sharing the Good News by assuming that we have it all figured out – it was really refreshing to not focus on ‘winning’ anyone to Christ but to merely invite them to spend time in communion with God – what the lawyer lay-leader wrote on the wall was equally valued and honored as what the six-year old drew. Thank you for your prayers and encouragement. It has been so uplifting to partner with you in prayer. We are already beginning to talk about when we will host our next 24/7 prayer room. Maybe the Lord is laying it on your heart to get involved where you are? It is a strange and wonderful and, maybe most importantly, new thing I’m experiencing with the opening today of our first prayer room: spending consecutive hours focused on Jesus. Yes, that means that a couple of people didn’t show up. Yes, I wish more had signed up today, but I’m finding myself drawn to this warm, cozy room; eager to see what new request or poem or picture hangs on the wall. We’re learning how this works. We’re learning the importance of communicating details, of reminding people, of being prepared beforehand, of being prepared for spiritual attack before, of keeping the focus on spending time with Jesus. I had hoped to have more manpower to be able to gather prayer requests from the city – all in time. I like that we are doing it anyway, flawed, imperfect, errors – it is OK, because we’re spending lots more time with Jesus than we normally would. A Catholic lady named Raimonda came today for an hour and as she came out she marveled at how quickly the time passed. As Anna arrived and went in to replace her I prayed with them. Sandro showed up and joined his wife in the room – and they, too, were encouraged and said the time flew by. I find myself fumbling over how to talk about this with people here, how to explain it, promote it, invite people to it. To a traditionally Catholic mindset, the idea of walking into a church to pray is not foreign – I would venture to say that they make more of a habit of this than most non-Catholics I know. But the idea of a ‘place set apart’ and of signing up for hours and the creative expression all seem to be uncharted waters for most everyone here. I argued with our friend Emanuele this morning (he came to photograph the room before it opened) about how to translate the phrase ‘write down a confession.’ “You don’t do that,” he told me. “Only criminals write down confessions.” I smiled – he’s an aspiring lawyer. So now, I sit here in the assembly room of our rented location at 1:20 Saturday morning. In the entry room, Massimiliano, who is on-call tonight, is trying to get an hour of sleep on an inflatable mattress and blanket that smells like mothballs. Brian is praying in the prayer room. I occasionally hear him strumming something on the guitar. And through the windows to my left, I hear the laughing, the clinking of beer bottles, the thumping of disco beats from the club below us. Father, do something crazy…starting in me. Downtown Ancona is nestled between two sets of hills, the second of which ends in cliffs that fall to the sea. In the very bottom of this little valley is a street that goes from one end to the other, each end opening up onto the sea. This is the 'elbow' of land that juts out into the sea which gives the city its name (ankon is greek for elbow). Recently, the downtown section of this street (Corso Garibaldi) was permanently shut off to all but foot and bicycle traffic. This plan, approved by our mayor, Fabio Sturani, involved re engineering the flow of traffic downtown so that anyone coming from the north into downtown enters through the new tunnel and drives DIRECTLY IN FRONT of our facility. Anywhoo - those who have shops along Corso Garibaldi have supposedly seen a drastic decrease in business and about half of them are complaining by putting neon stickers in their windows protesting the creation of this isola pedonale (pedestrian island) saying that the island isolates the shops from customers. It is funny to see how the mind of the Ancona people works. They are so used to there being traffic on this street that even now, though the street is completely empty of cars, they walk on the sidewalks. I, on the other hand, am proud to walk the middle. I embrace the new Ancona and am excited to see it transformed, renewed and to see old ways made new. One of our friends here in Ancona, Francesco, has been busy lately filming and editing an indie film. Late one night in September, 2001, while in NYC, he got the idea for it and is just now getting around to completing it. Check it out here. Well, we got back from camping yesterday afternoon and had just enough time to put everything away and clean up before picking up Heather Wimsett and Darlene Runner at the train station. Heather has been working in Romania for several years and Darlene is her intern, there since February. They will be staying with us until Monday. We house lots of guests in our 'line of work', but it is a special honor to host these two - you can just sense God's presence when you're around them. As soon as I have the photos downloaded from our camping/rafting adventure, I'll post them. Well, at 7:00 am, we're heading out. Heather and the kids will go with the Roterts to catch the bus to the train station to Terni. Meanwhile, Marcus and I will ride in the camping-equipment-laden car to the site, near the Marmore Waterfalls in Umbria. We will spend the week there, fending off a rainy forecast and making memories. 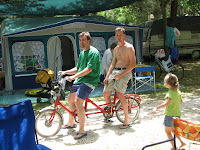 Tuesday, Massi and Maurizio will be meeting us to go rafting and to celebrate Mau's 45th birthday. (We all are chipping in to buy him an MP3 player.) If you need us, you'll have to wait till we get home or call our cell phone. The kids don't start school until September 17th! I'll post when I get home about the experience - camping in Italy is NOT like camping in the U.S.! Our 11th anniversary was Friday and I surprised Heather by booking a room at the Hotel Federico II in nearby Jesi. We enjoyed the 18 hours away from the kids, the dinner in Moie and each other's company. I'm so lucky to have Heather and love watching how she continues to grow and blossom into the woman God intends for her to be. The other night as our family walked in front of Ancona's principal theater we noticed the new poster announcing the coming concerts and performances. We got really excited when we noticed what was scheduled on November 17th (the 12th anniversary of our engagement). A ballet (Heather's favorite) set to the music of Vivaldi's Four Seasons (Jason's favorite) here in our very own, beloved Ancona. Yahoo! Well, we're done. After three straight days of meetings with very few breaks, we emerged tired, yes, but united, excited and ready for action. I'll be sharing with you in the next few days some of the results of our conversations including our reworded vision statement, our primary purpose for the next 5 months, our 6 primary objectives which will get us there and some explanations of some of the changes. One of my favorite things about the retreat was the emergence of the primacy of prayer - more than just a value or a 'we should because we're Christians' there seems to be a passion for it and a commitment to make it central to everything we are and do: in practice, in teaching, personally, corporately, in discipleship and in evangelism. I am very proud of our team for being willing to be very honest and transparent, willing to sacrifice and share for the furthering of the church here. For all of your prayers and encouragement, thank you! If I can now ask you to pray for our team as we take the next step, which is to, together, turn these conversations into goals. Please pray for wisdom, unity and above all, protection as we all sense that Satan, he who would keep everyone from getting any closer to Christ, is not pleased with our progress. Whew, just got back from jogging with Brian - we broke through another level today - jogged for 4 minutes/walked for 2, five times for a total of 30 minutes. It feels really good to push through the pain and discomfort, knowing that my body is burning fat, building muscle and that my lung capacity is improving. I feel a similar way about our conversations today. We met again from 8 to 5 with just a few short breaks and though we were tired, sleepy, and we didn't always agree on everything, I feel we were able to really push through and get to a new level today as a team. We're trimming away unnecessary things, building new and healthy habits and improving our ability to work together toward a common goal. Thanks for praying! We just finished our first day of meetings and I couldn't be more pleased. We are meeting at the Rotert house today, tomorrow and Wednesday. Matt & Angie are watching the kids for us this week which is a real blessing. We dropped the kiddos off before 8:00 and started our conversations with a mug of Swedish coffee and some pastries. Today's agenda was mainly team-building and I feel we were able to lay a really good foundation for the next couple of days' worth of conversations. Tomorrow we will be revisiting some of our team's core values and documents as well as talking about the vision for what's ahead. Thanks for praying! -icebreaker: what are you thankful for? Meanwhile, the adults (Heather & I, Brian & Heidi and Marcus), gathered to pray, sing and worship together. Afterwards, the guys and older kids went up to Forte Altavilla to lay on the grass and watch the shooting stars. I'm excited about the next three days - there's lots to discuss. Tomorrow, Monday, we will be focusing on team building, looking at lots of things, among them some of Lencioni's principles of teamwork. Thanks for praying! I've often said that the hardest thing about living overseas is watching my kids adjust back-and-forth between American and Italian cultures. Whether at school, at home, traveling, at play, however it manifests itself, it is the hardest thing for me to accept about cross-cultural ministry. Today, I was able to pinpoint one of the triggers for this sentiment. I've recently begun jogging again, thanks to the promptings of my teammate, Brian. We drive up to the Cittadella park and jog around for 30 minutes. It is a beautiful setting: a park on the top of a hill overlooking the city inside the walls of an ancient fort. There are lots of families with kids at the playground and people laying on the grass or walking around. As we were jogging this evening, I saw two grandparents sitting on a bench, baby grandchild in a stroller. They just sat there together, smiling, looking at their grandchild...no hurry, no rush, just enjoying the cool, summer evening with their grandchild. While our parents do a good job of keeping in touch and showering us with love, both while we are away and 'at home', it is a gut check every time I see it. It makes the times when we do return to the U.S. that more special, that more important. It pushes us to pack in as much time and as many memories into those weeks and months as possible. It encourages us to be creative in how we communicate with grandmas and grandpas. In the end, it makes us grateful for having the kind of parents we want our kids to spend time with. As I've looked back on our team's history, I laugh at how many transitions we've had. The last couple of months have been building up to what I believe is one of the biggest our team has faced yet. On July 31st, Matt & Angie Crosser will transition out of their full-time status on the GoAncona team and become full-time team leaders of the GoVerona team. Matt & Angie arrived in Italy in March of 2001 into a team context that was still storming and heading into norming. In the past 6 years since then they have become some of our closest friends. We've seen each other's ugly sides and been with each other through the best and the worst of times of this ministry in Ancona. Since being accepted as the leaders of the new team, we have continued to work together toward a smooth transition and it really has been. We've talked lots about this month and how there would be lots of 'lasts' and yet for all the talk and preparation, I'm beginning to experience the reality of those words and thoughts. Last retreat, last outreach event, last English lesson, last staff meeting, last team meeting, last...you get the picture. We will, of course, still see them for the next three months while they prepare to head back to the U.S. and we will still stay in contact when they are up North, but still, the reality of a post-Crosser team is starting to set in and I find myself full of emotion and anxiety. The view is always incredible. But on a summer night, sitting on the steps, the Marchegian shoreline stretching out before you, lighting up the sky, it really is something. The wind was strong, carrying to us whispers of conversations mixed with sounds from the shipyards far below, the whining of high-speed drills and saws - an eerie mix, like the growls and cries of beasts emerging from the inky sea that surrounds us. We sat on the steps of the city's Cathedral, ancient steps built hundreds of years ago on top of the ruins of a pagan temple built in times even further removed. The statues of lions stood as guards behind us as the wind whipped our hair about and played tricks with our voices. Beautiful setting for a difficult conversation. Romantic backdrop for hard questions and tough decisions. As we sat and talked with one of the members of the summer team, a guy approached the place where we sat and sat on a step below us. He fumbled around to light a cigarette and then to remove his guitar from a red, nylon case. He hummed and strummed, adding his song to the sounds around us, and in this stranger I saw a shadow of the young man sitting beside me. Somehow the stranger helped, the shadow strengthened my resolve. Standing at a crossroads, difficult decision to make, I saw clearly what was at stake and which direction to take. At any point, I guess we all stand there, at that crossroads looking left and right, and through the fog, we can probably make out the shadow of what we could become. Our future is not written for us, but in an incredible demonstration of faith in us, we are allowed the privilege to carve out our life, to choose our path, all with the hope of returning to Him who formed us.